Companies return money to shareholders in a number of ways. The most common way of redistributing money to shareholders is via dividends. However, capital gains payments (typically from a mutual fund) or return of capital payments are also possible distribution methods. Maintaining complete and accurate distribution transactions in your StockMarketEye portfolio is important for accurate performance reporting. You can read more about the uses of your portfolio’s transactions in the section, Transaction Accuracy and Completeness. You can enter these distribution transactions in StockMarketEye by following the instructions below. If your StockMarketEye portfolio was imported from a brokerage, you most likely do not need to manually enter distribution transactions, as they will be included in your portfolio when retrieving your portfolio’s latest transactions via the “Update from brokerage...” feature. Open the StockMarketEye portfolio where the distribution occured. This will open the “Distribution Declaration” window. Interest In - Interest paid by this holding; Note: interest paid by the portfolio, such as interest on your cash balance, should be recorded using a cash transaction. Amount / Share - The amount of the distribution per share. Dividends are typically declared on a per-share basis. 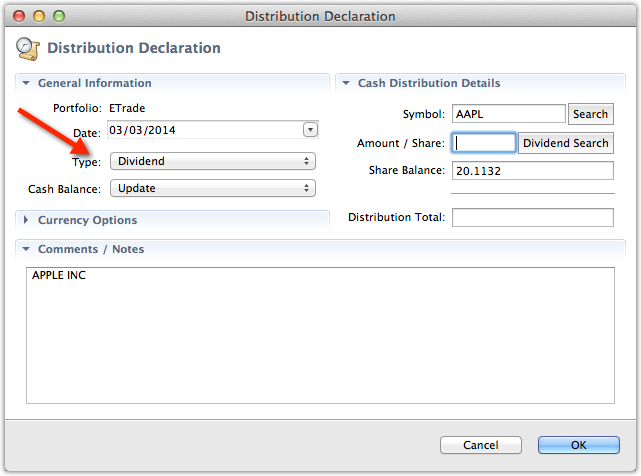 The total amount of the dividend payment is the “Amount / Share” times the number of shares you own. Share Balance - The number of shares owned at the time of the distribution. 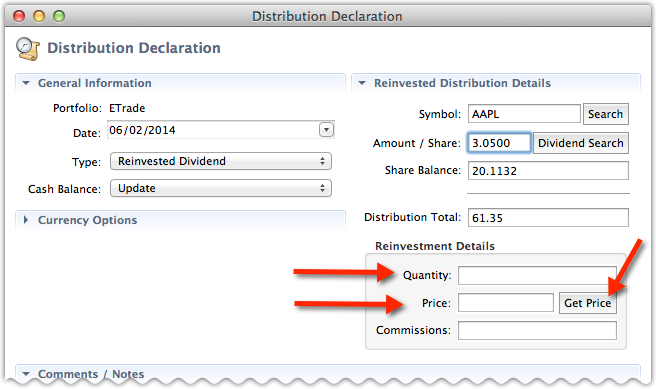 This field is typically filled in by StockMarketEye when you open the “Distribution Declaration” window with a stock selected. Distribution Total - The total amount of the distribtuion. This will typically be “Amount / Share” times “Share Balance”. 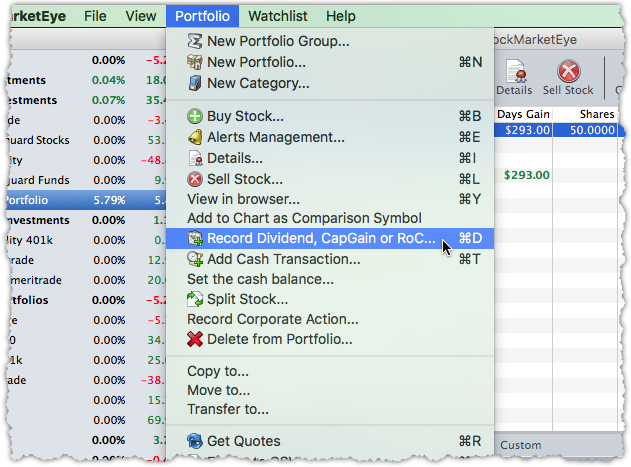 The “Dividend Search” button can help with filling in these fields. 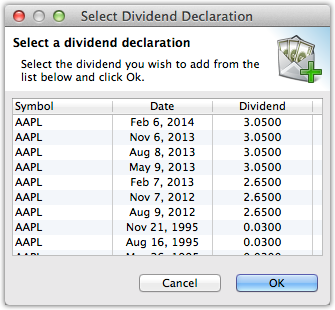 When you click on this button, a new window will open showing the known dividends declared in the past for this stock. Select on one of them from the list, then click OK. 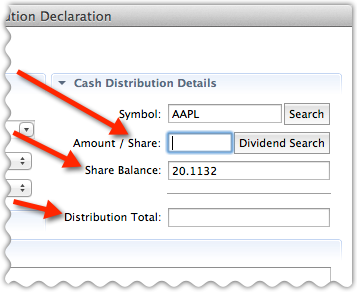 The “Amount / Share” and “Distribution Total” fields will be automatically filled in based on the selected dividend’s information. Note that the “Amount / Share” and “Share Balance” are not strictly necessary and you can simply fill in the “Distribution Total” amount. However, for transaction completeness, we recommend filling in the “Amount / Share” and “Share Balance” fields when possible. When you have selected one of the reinvested “Types”, an additional section, “Reinvestement Details”, will be shown. In this section, you should fill in the details of the reinvestement. Quantity - The number of shares recieved from the reinvestment. Price - The price paid per share for the reinvested shares. “Quantity” times “Price” should be equal to the “Distribution Total”. Commissions - Any fees or commissions paid due to the reinvestement. You can typically leave this field empty or filled in with 0. The easiest way to enter the reinvestment details is to click on the “Get Price” button. This will retrieve the closing price of the security on the selected “Date” and fill the “Price” field with that value. It will then also automatically compute the “Quantity” from the “Price” and “Distribution Total” fields. However, you can also fill in the “Reinvestment Details” with the specific numbers recieved from your brokerage. Click on the “OK” button to record the distribution transaction. If this is a reinvested “Type”, a new sub-lot will be added to your holding in the Prices view.